Understanding the sector and industry composition on the Toronto Stock Exchange (TSX) can help you invest better. To understand how to invest in Canada, specifically in dividend stocks, it’s important to understand the breakdown of the stocks by sector and industry. It will enlighten you about the Canadian economy. The breakdown will lead you to understand the market exposure and the economy exposure which leads you to understand the business strength and the growth potential as well as identifying the competition. My TMX Screener search found 418 dividend stocks on the TSX. The initial search includes all of the preferred shares for a total over 700 but after you remove them, you have 418 dividend paying companies on the TSX. 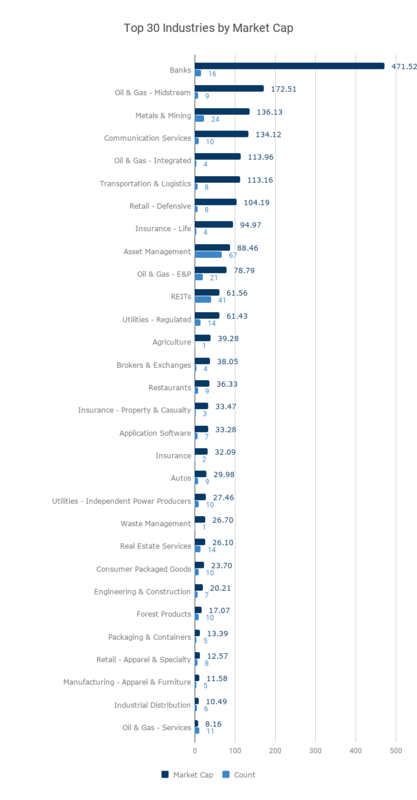 It’s interesting when you look at the number of companies by sector or by market capitalization. The correlation between the two data points can really show the potential of a sector or how hard it is for newcomers to compete. Below is a table and a graph to present the data. Take some time to take it in but the insight is through the industry further down. The industry breakdown is really telling. 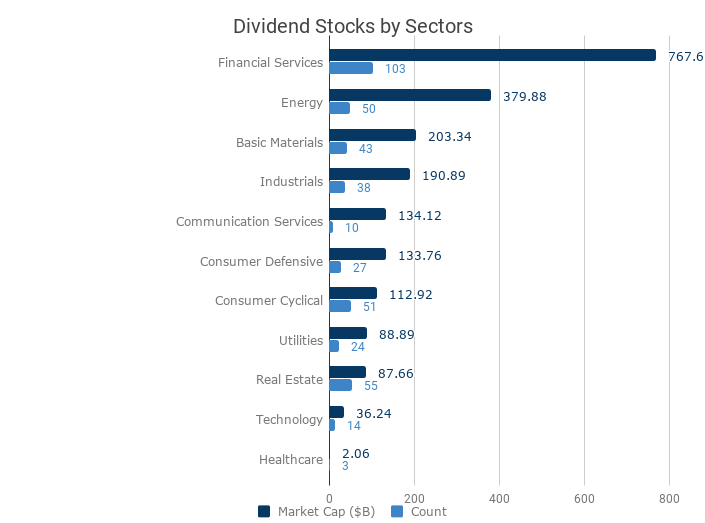 16 dividend stocks control a significant value of the market and most of the value is within the top 12 industries. Here are the top stocks for the 12 major industries tracked on the Dividend Snapshot stock list. The stocks listed are essentially the largest companies on the TSX (as long as they pay a dividend) and the competition is basically outlined. All you have to do is pick the best stocks that matches your investing criteria.